Nike keeps the momentum going for the recent retro Hurache craze, releasing a special collection featuring both models of the iconic shoe in a dope red/black colorway deemed the “Love/Hate” Pack. The pack includes two pair of the classic low Air Huraches in two colors, one features a predominately bright red upper with black accents, and the other comes in predominately black with red accents. 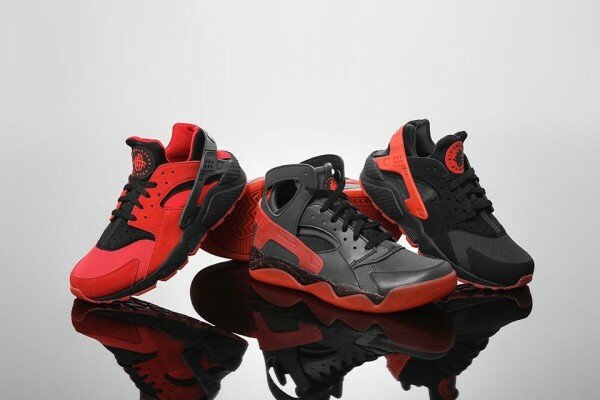 The pack also includes a pair of the high-top black Air Flight Huraches with hints of red and black/red specklesd soles. The Nike Huarache “Love/Hate” Pack is available now exclusively over at Korean sneaker/lifestyle clothing retailer Kasina online shop and will hit US retailers very soon. Head over right now and grab each pair.